The NHRA Breakfast will feature drag racing legends Kenny Bernstein, Joe Amato, Don “The Snake” Prudhomme as well as current NHRA driver John Force. FOX broadcast announcer Brian Lohnes will serve as the panel moderator, asking probing questions to provide attendees with a revealing glimpse into some of the best kept stories of the historic Gatornationals. The NHRA Breakfast at the SEMA Show will be held Wednesday, Oct. 31. from 7:30 – 9:00 a.m. at the Westgate Las Vegas Casino Paradise Events Center. The annual NHRA Breakfast is part of the 2018 SEMA Show, the premier automotive specialty products trade event in the world which draws the industry’s brightest minds and products to one place, the Las Vegas Convention Center, October 30 to Nov. 2, 2018. The NHRA Breakfast is open to all registered SEMA Show attendees at no cost—however tickets are required. A continental breakfast will be served. To order your event ticket or register for the show, visit www.SEMAShow.com/register and click Add Event Tickets. Kenny Bernstein – Nicknamed the “King of Speed,” Bernstein was the first driver to break the elusive 300 mph barrier at the Gatornationals in 1992. He’s won the Gatornationals four times in his career and was the first driver in history to win a championship in both Funny Car and Top Fuel. Joe Amato – Amato secured 52 national event wins in Top Fuel and five world championship titles. He raced to three career victories at the Gatornationals. He was the first driver in the sports history to run 280-mph in 1987 and a 4.5-second pass in 1996. Don “The Snake” Prudhomme – Prudhomme had 49 national event victories – 35 in Funny Car and 14 in Top Fuel – as well as four consecutive Funny Car world championships. Five of those event wins happening at Gainesville Raceway. As a team owner, he garnered two Top Fuel world championships with Larry Dixon as his driver in 2002 and 2003. John Force – A 16-time Funny Car world champion, Force has 149 career victories and counting, making him the winningest driver in NHRA history. 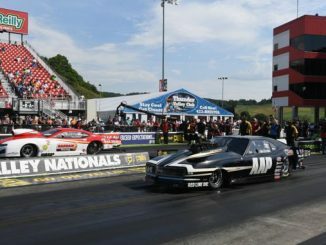 He has secured eight career victories at the Gatornationals, most recently in 2017.